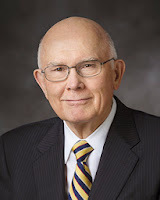 Elder Dallin H. Oaks (b. August 12, 1932) served as president of BYU from 1971-1980. He was then appointed as a justice of the Utah Supreme Court, and resigned when he was called to the Quorum of Twelve Apostles in 1984. "Our Savior gave Himself in unselfish service. He taught that each of us should follow Him by denying ourselves of selfish interests in order to serve others. "'If any man will come after me [He said], let him deny himself, and take up his cross, and follow me. "It is not easy to give up our personal priorities and desires. 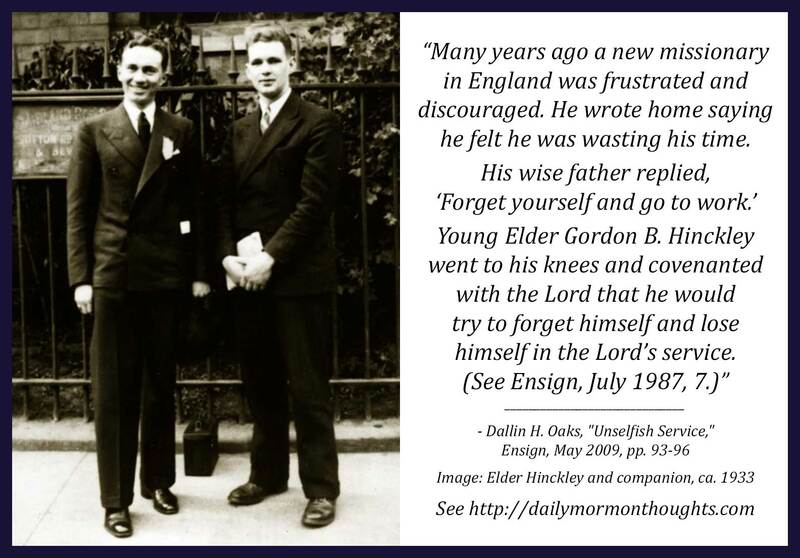 Many years ago a new missionary in England was frustrated and discouraged. He wrote home saying he felt he was wasting his time. His wise father replied, 'Forget yourself and go to work.' 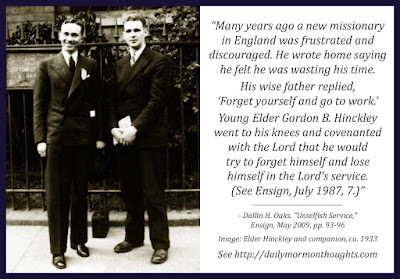 Young Elder Gordon B. Hinckley went to his knees and covenanted with the Lord that he would try to forget himself and lose himself in the Lord's service. (See Ensign, July 1987, 7.) Years later, as a mature servant of the Lord, Elder Hinckley would say, 'He who lives only unto himself withers and dies, while he who forgets himself in the service of others grows and blossoms in this life and in eternity.' (TGBH p. 588.)" I liked Elder Oaks' postscript to the story of young Elder Hinckley, as he reflected many years later on the blessing that unselfish service is; anyone who who discover the secret "grows and blossoms in this life and in eternity."